Day 1: Say hello if you’re doing the #rpgbookclub this month. Day 2: Have you read Cosmic Patrol before? Have you played it? As a PC or a GM? Day 3: If you were in a game shop and Cosmic Patrol was on the shelf would the cover make you buy it? Day 4: Did you like the short story? Did it tell you what the game was about? Day 5: What music would you play to set the mood? Day 6: What do you think about Cosmic Patrol puts the setting before the rules? Day 7: Based on the Gazetteer what adventure do you really want to have? Day 8: How does the setting make you feel? Day 9: What place in the Gazetteer did you like most / least? Day 10: Would you use one of the ready made Dossiers or create your own Patrolmen? Day 11: Which Dossier do you want to play? Day 12: Is character creation too fast or too slow? Day 13: Did you want more or less choice when making characters? Day 14: You know someone who might play the game. What film or TV show do you put on to soften them up? Day 15: Do you find the game rules easy to follow? Day 16: Do the rules fit the setting? Day 17: What question would you ask the author about the rules? Day 18: Does it run smoothly or are there any rules that get in the way in play? Day 19: In (pretentious) cooking they talk about mouth feel for the texture of the game. If the game was food what would its mouth feel be like? Day 20: Which of the mission briefs would you use? Day 21: Any resources you’ve found you’d recommend to use with Cosmic Patrol? Day 22: If you could add one thing to All Hail the Fictioneers what would it be and why? Day 23: What rule would you steal for another game? Day 24: What supplements would you like to see? Day 25: Would you play the game? 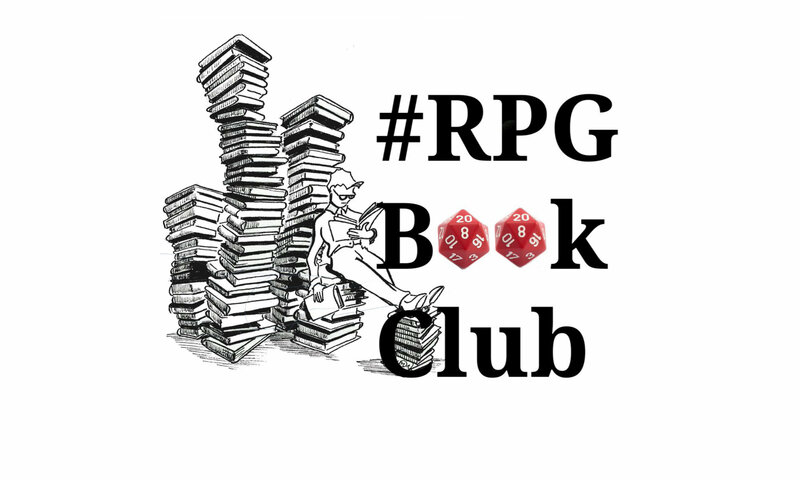 The #rpgbookclub started as a happy twitter accident on 10th June 2018. We read, talk, cogitate, discuss, digest and even possibly play a different table top Role Playing Game each month.